"It's a nice feeling. Maybe you grip the stick a little bit less when you see a couple going in and see a little bit more of the net," he said. "Obviously, the linemates and the other players made great plays on those goals, and some nights they just seem to find a way and others they don't." Schwartz opened the scoring at 11:41 of the first. He got the puck in the corner, skated into the left faceoff circle and lifted the puck from a bad angle over goalie Mikko Koskinen's glove. Schwartz scored his second goal at 5:42 to make it 3-0. He fired a wrist shot from the left circle that hit Koskinen's right pad and trickled in. "I think you need to relax a little bit. You feel more confident with the puck," Schwartz said. "Maybe find open areas a little more. I think in any sport when you're having a little bit more success it gives you a little bit better feeling." "It's a tough loss," said Edmonton coach Ken Hitchcock, who used to coach the Blues. "We spent a lot of energy coming back in the game. The fifth goal was the killer for us. Against a good team like that, you can't take a penalty 200 feet from your net. Then we couldn't get it killed. We couldn't get the faceoff won." 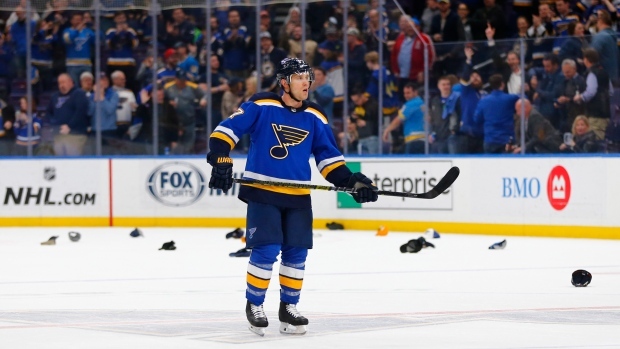 "Obviously, it's going to give him confidence," Blues coach Craig Berube said. "A player like that, that hasn't produced the way he wants to and the way we expect him to, it's tough. Getting a hat trick tonight will give him confidence for sure." "It's not just special teams," he said. "They were outshooting us 23-5 at one point in the second. Our game is the best when we're forechecking and we're creating loose pucks. Tonight we just got away from that a little bit and the other team did exactly that and they got rewarded for it."